These pistachio oatmeal cookies are practically paleo since they contain no refined flour, no refined sugar, and no dairy. What’s even more enticing is what they do contain, namely maple syrup, ground cardamom, pistachios, and golden raisins. 1. In a large bowl, combine the oats, spelt flour, almond meal, baking powder, and cardamom. In another bowl, combine the coconut and olive oils, maple syrup, vanilla, salt, and orange zest and whisk until well combined. Pour the wet ingredients into the dry ingredients and stir until everything is incorporated. The mixture will be very wet. Set aside for 10 to 15 minutes to allow the dough to thicken slightly. 2. Place the golden raisins in a bowl, add the boiling water, and let soak for 10 minutes. Pour the soaked raisins through a strainer and set aside to drain well. 3. Preheat the oven to 350°F (180°C). Line a baking sheet with parchment paper. 4. Add the drained raisins and pistachios to the cookie dough and mix just until combined. 5. Using a damp 1/4 cup measure, scoop the cookie dough onto the baking sheet and flatten it slightly. Repeat with the remaining cookie dough. (The cookies don’t spread during baking so feel free to crowd the mounds of cookie dough closer together on the baking sheet than usual.) Bake the cookies for 15 minutes or until golden around the edges. If you don’t have any ground cardamom on hand, grind 18 cardamom pods as finely as possible in an electric spice grinder. Use a small strainer to sift the ground pods, and toss anything left in the strainer. You should have 1 teaspoon ground cardamom when you’re done. Okay, normally I'm not a "healthy" baker, but these pistachio oatmeal cookies may have changed my mind. At first I didn't think about the lack of white flour or sugar, I focused purely on the pistachios and cardamom, as they enticed me. The result was wonderfully spiced, hearty, and just sweet enough. The addition of the spelt flour, almond flour, and oats made these cookies very satisfying in the sense that 1 was enough, not 7. Once I went out and gathered all of the ingredients, the cookies came together in very little time. About 20 minutes was all it took (with the waiting time for the dry ingredients to absorb the wet and for the raisins to soak.) The cookies don't spread, so you can place them fairly close together on the baking sheet, which is what I needed to do to fit all of them. I ended up with 21 good-sized cookies. They held together but were pretty crumbly with all the healthiness and fillings, so take a napkin with you! I was ultimately very happy with the flavor combinations. The cookies were delicious! The most exotic oatmeal cookie I've ever had! Super aromatic without being overpowering, nubby with rich pistachios, sweetly coconut-y, and anchored by familiar oats and raisins. Nicely balanced but saltier than a child's cookie. I found the recipe to be just about perfect in instructions and timing. The cookies don't spread, so feel free to put them closer together than usual on the baking sheet. I had 22 cookies from this batch. 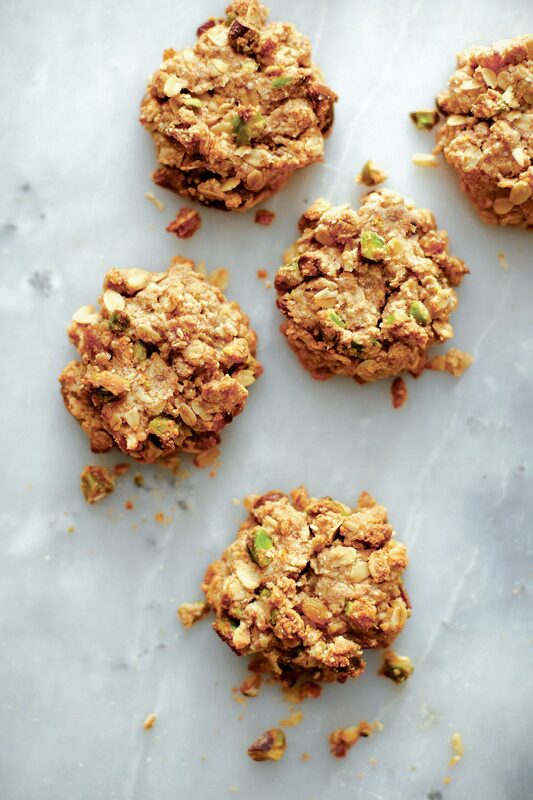 Pistachio Oatmeal Cookies Recipe © 2014 Amy Chaplin. Photo © 2014 Johnny Miller. All rights reserved. All recipes and photos used with permission of the publisher. Would this work with a gluten free flour blend (instead of spelt) such as the wonderful Huckleberry cookbook’s brown rice flour, oatmeal flour, potato starch, cornmeal? Candace, each gluten-free flour blend, whether store-bought or homemade, is different than the next, which means that, sadly, we hesitate to guarantee that the recipe will work with any and all gluten-free flour blends. That said, most gluten-free flour blends are very versatile and from the sounds of the ingredients the one you mention has all the right nutty tastes and nubbly textures for this recipe. 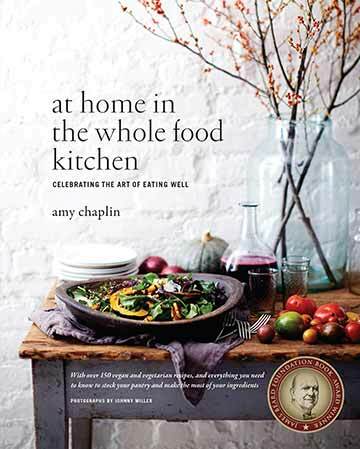 Plus, I love the Huckleberry cookbook. I’m pretty confident it would work fantastically. Mind letting me know how it goes? Are these crunchy or chewy? Thanks! Exactly what I needed to know; thank you!